We left Rock Sound at 0845 and arrived in Governor’s Harbour at 1220. It was an easy motorsail. The holding in this anchorage is not very good with a thin layer of sand and grass over rock, but there is very little wind and current, so we are satisfied that there won’t be a problem. While there aren’t many boats anchored here, we did see an unusual vessel. 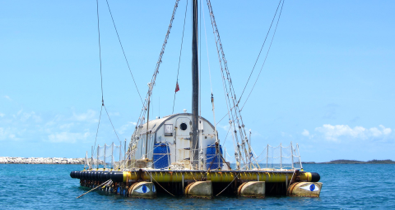 Pictured above, this raft actually has a sail, solar panels and a wind generator. Some men at the ice cream parlor told us that the owner sailed it from the UK, through the Caribbean to Governor’s Harbor. Amazing! He patterned it after the Kon-Tiki and the name of his vessel is the Antiki. He sold the vessel to someone here and went back to the UK. 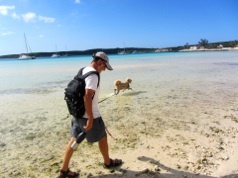 Eleuthera has a lot to offer, but doesn’t have the clear aqua water of The Exumas. The beaches on the Atlantic side are beautiful pink sand but it usually takes a long hike to get there. The beach by our anchorage is rocky. In the photo Mark is holding on to Daisy’s leash and like the water dog she has become, Daisy is romping through the water. In Daisy’s eight years she has never loved the water, although she has tolerated it. This year she happily ventures out over her head to swim and always runs into the water to cool off. A few months before we left for this cruise, we took her off all treats and people food and switched to a dog food that is almost all meat and no fillers, just a few percent vegetable. Her allergies disappeared, including infections between her toes. We think the salt water may have been stinging her feet at times until this year. Stupid us for not noticing if this was happening. After we arrived and had lunch, we dinghied ashore into the town. 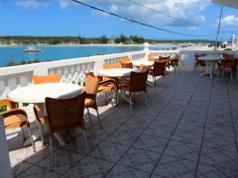 Governor’s Harbor is the capital of Eleuthera and is situated on a steep hill. On one side are beautiful large homes and on the other side are very old run down houses. The grocery store isn’t as good as Rock Sound, but has everything we would need. There is a large library housed in an old house which has a few shelves of books for exchange and a large lending library. They broadcast free wifi which we can pick up from the anchorage. There is a large police building and even a fire department with trucks. 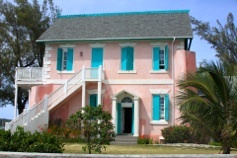 Fires are a huge problem in The Bahamas becomes most settlements do not have fire departments. Before we headed back to the boat stopped at a real ice cream shop located by the government dock. They had at least 12 flavors and large ice cream cones were just $2.00. We each had a cone and Daisy met a new friend. The cat totally ignored Daisy. While we were enjoying our ice cream a rooster wandered up under the outside tables. 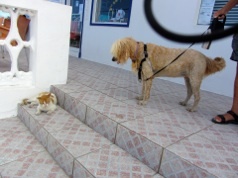 It did notice Daisy and the cat and disappeared. Chickens are all over the place here, in yards, streets and obviously even ice cream parlors. All Bahamians live on islands, but you rarely see them swimming in the water. 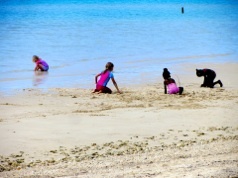 Therefore we had to take a photo of these cute young girls frolicking on the beach. They found a small area of sand and were digging holes, then running into the water to wash off. As with all children here, they engaged in conversation with us and asked about Daisy. We are starting to think when we need to head back to Florida. On Monday we are sailing to Hatchet Bay and will probably stay in its well protected anchorage while a front comes through on Tuesday and Wednesday. Then we’ll to to Spanish Wells and wait for a window to start back to Florida. That could take up to a week or more, depending on the weather. Our insurance requires us to be back in Stuart on June 1. Tomorrow we hope to ride our bikes up the big hill, well walk up the hill and ride down, to the old Club Med beach.